This article is about the summon stone. 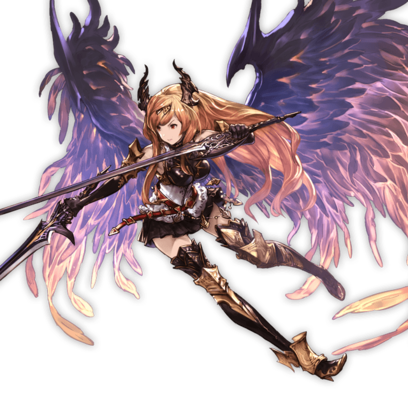 For the raid, see Dark Angel Olivia (Raid). 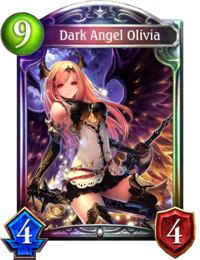 For the recruitable character, see Olivia. The war goddess sails through the sky on onyx wings, inciting the combatants below. Together they will create a new world. 25% boost to Dark Normal ATK and HP. 40% boost to Dark Normal ATK and HP. 60% boost to Dark Normal ATK and 40% boost to Normal HP. 25% boost to chain burst. Massive Dark damage to all foes and inflict Delay. 9T9 turn cooldown. Massive Dark damage to all foes and inflict Delay. 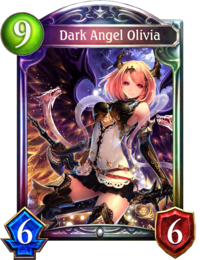 Reduce skill cooldown for Dark allies by 1 turn. This page was last modified on 3 February 2019, at 18:07.